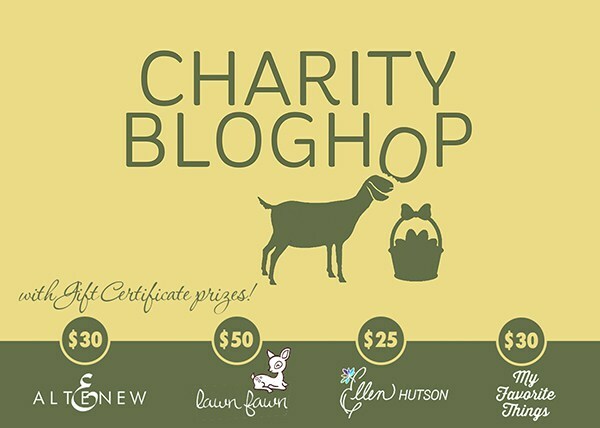 So, what is the charity bloghop? Well, Sandy had an awesome idea to bring a little happiness and spread some good in this world by donating to a charity and then we’d all blog about it! Because she rocks like that. Depending on the charity you donate to, you may receive a physical gift or it may go to someone in need. In my case, I chose to adopt animals from Defenders of Wildlife and World Wildlife Fund. 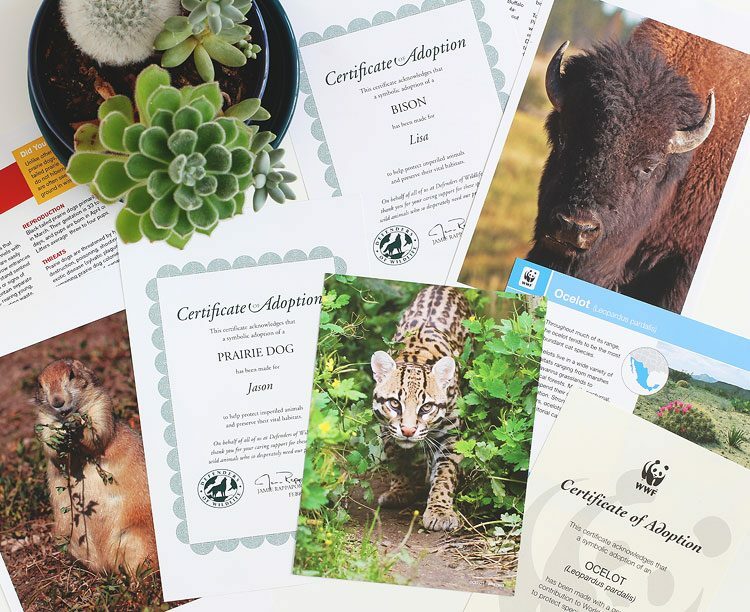 I opted to just go with a photo and certificate so that more of my dollars would go to helping wildlife. As you can see, I couldn’t choose what critter I wanted to help this time — it was just too hard! So I adopted a few — here’s my herd! I’m a prairie girl through and through — my instagram and social media name “sideoats” is because sideoats is the state grass of Texas. So I adopted two prairie animals from Defenders of Wildlife. They have many more animals to adopt as well. A prairie dog that I adopted for Jason! We’re both into prairies and have volunteered to help save Texas prairies for years now. One time we got to help with a prairie dog rescue, where we relocated some dogs to a prairie that’s protected by the Native Prairies Association of Texas. It was so cool! We try to visit the cute little guys every year. I feel that prairie dogs are really misunderstood and need our help. “Though millions of bison once thundered across the Great Plains, they were almost entirely wiped out. Today human intolerance prevents bison from regaining their native habitat, and only a very small number of genetically pure wild bison are allowed to exist in small, select areas. 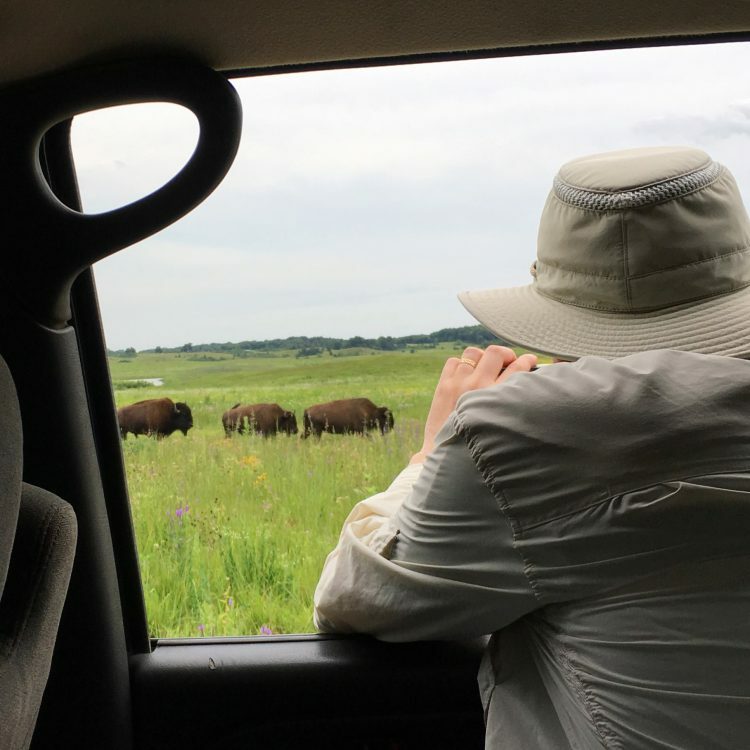 We were lucky enough to see bison at Nachusa Grasslands at the North American Prairie Conference, summer 2016. Then I was checking out World Wildlife Fund and I saw where they have an ocelot for adoption, so had to adopt one of those too. We have a small population of ocelots here in Texas but we haven’t got to see one — at least not yet! They are shy, nocternal cats so it’s rare to see one anyhow, never mind that there aren’t many left. Now then, on to my cards! I did a *super* quick video of the technique for my daily sketch — I’m on day 77 of this sketch project, can’t believe it! I’ve outlined the steps below and added some tips and tricks for ya. 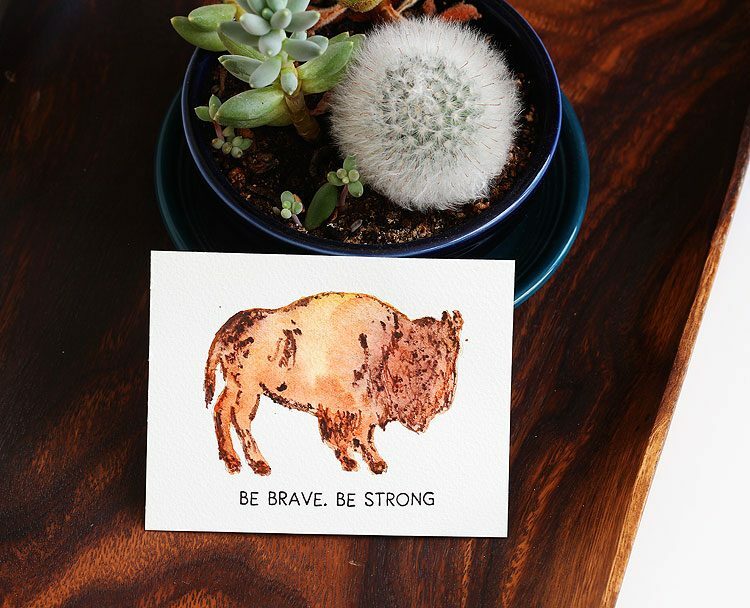 I decided to work with the bison for my cards, but the technique I’m going to share will work for most any animal. First off, you’ll need to find a silhouette of the critter you’re working with. I found my bison here in an education guide to the PBS Special, Buffalo War. I printed it out on cardstock, cut it out, and then traced it on to some watercolor paper. Here’s a tip for ya: I like to go over pencil lines with a kneadable eraser to lighten them. It helps make it where the pencil doesn’t show up on the final image. Step 2: Watercolor and Scribble! Next I grabbed various watercolors and kind of blobbed them on, not really paying attention to what colors I was using — you’ll see more below! Then while the watercolor was still wet, I scribbled in lines with a watercolor pencil. 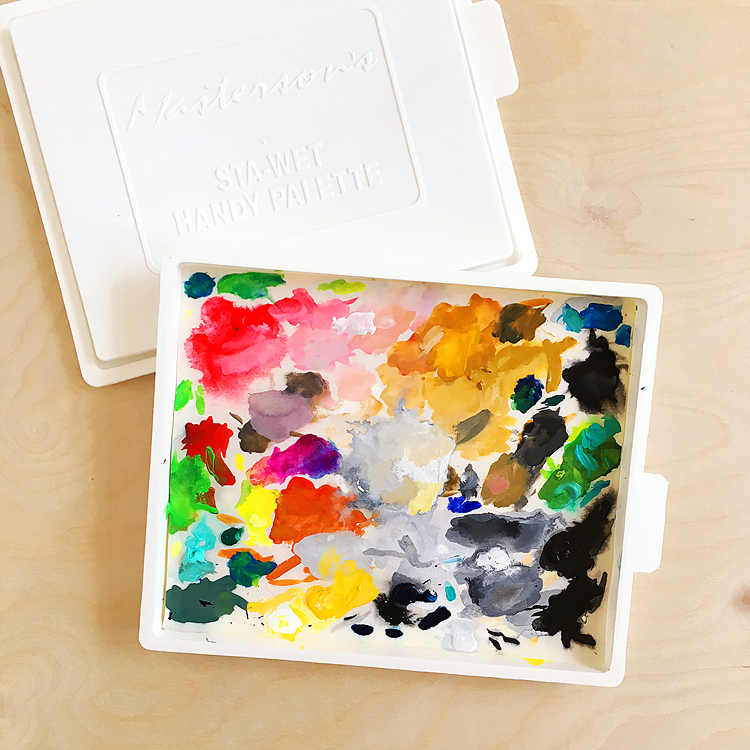 This is so cool you guys — the watercolor pencil will fade and feather and give you unpredictable results. Don’t like something? Add more watercolor over top — just not too much or you’ll make a mess, ha. It’s better to just go with it and have fun. I’ve tried this technique with both black and brown watercolor pencils and I love them both! I did a google search and found tons of bison photographs to help with where to put my scribbles. 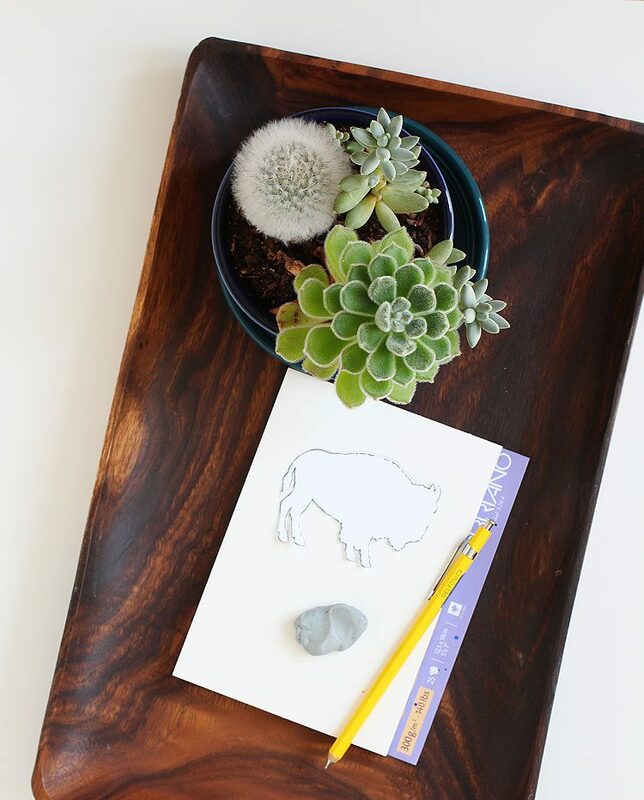 Oh and if you’re interested in bison like I am, check out my pinterest board. 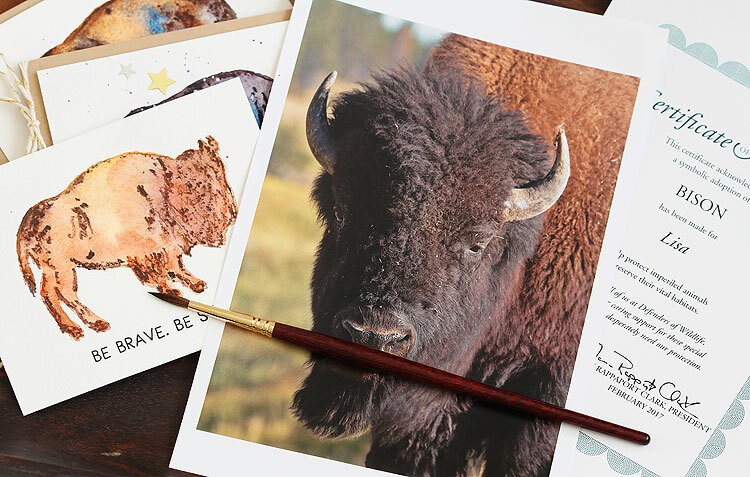 Love how the scribbling helps to define the bison, but it’s not just a boring black outline like you’d get with a stamp. Not that there’s anything wrong with stamps of course. But I love to switch things up like this sometimes. I thought the “Be Brave. 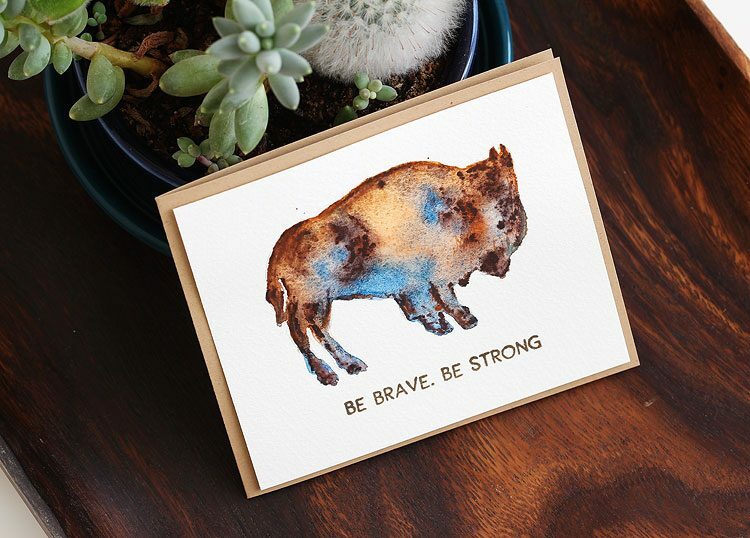 Be Strong” message from this Altenew set just went perfectly with the bison. I love the cacti in the set too! 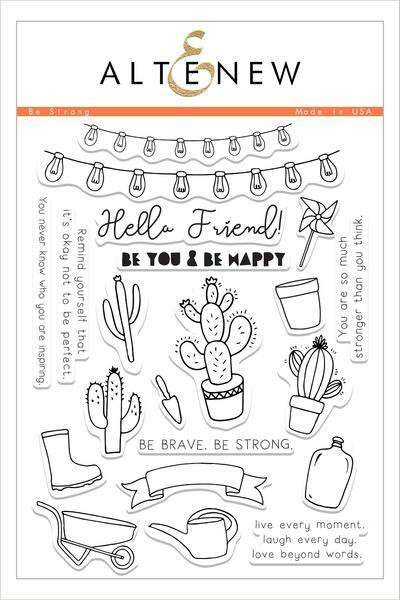 There are just so many great stamps in this Be Strong set! Plus Altenew is one of our hop sponsors — yeah! So, here are just a *few* of my cards — if you know me, you know I can’t make just one card at a time! Once I get going I just can’t seem to stop, plus it only makes sense while you have your supplies out. Tell me I’m not the only one like this, lol! I kept this card on the clean and simple side — I might go back and add some twine, but then again maybe not. It’s for a friend who has brain cancer that came back. He loves prairies too. 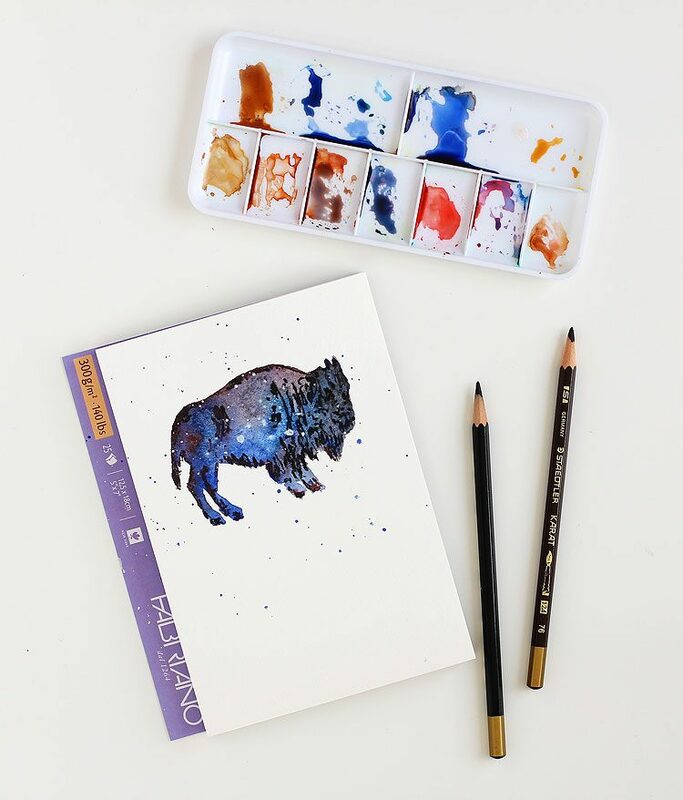 I used some highly granulating colors on this bison, including cerulean blue chromium. Next, a bison that I haven’t finished quite yet but I wanted to share her anyhow since the colors are so different. I don’t even remember all the colors that I used on this one oops! I did try using a brown watercolor pencil for the scribbling tho. I like how the brown looks with this, I think black would have been too harsh. Last but not least, this guy! 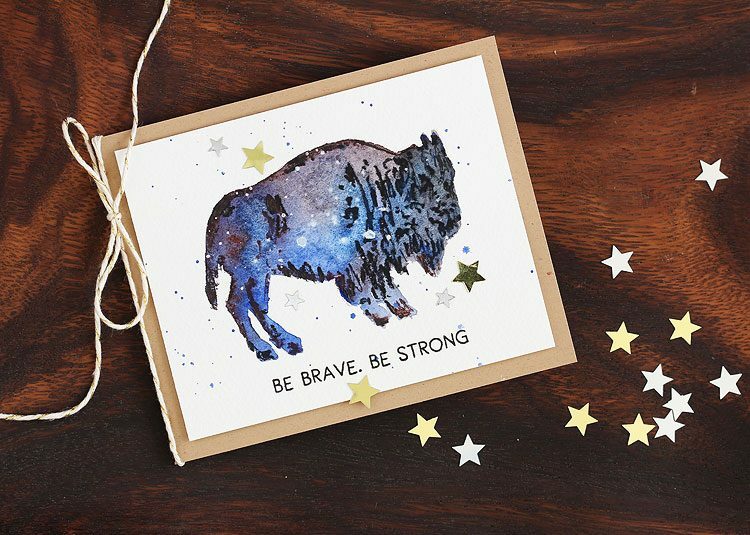 I’m calling him my “starry night bison”. For this one, after the watercolor was completely dry I splattered him with white mist. Then once that was dry I stamped the message and added some sequins. Done and done. You guys!!! So many awesome companies are helping inspire you to hop along and leave comments on all the blogs – Altenew ($30), Lawn Fawn ($50), My Favorite Things ($25), and Ellen Hutson ($25)! These companies all rock! Huge thanks to all of them. To enter to win these great prizes, just leave comments on all the blogs in the hop by Wednesday March 22. The more comments you leave, the more chances you have to win. Winners will be announced on Sandy’s blog on Thursday March 23, along with a total amount we’ve raised together! Yeah!!! Your next stop on the hop is Aimes Gray and I just love what she’s made! Wait until you see! Here’s the full hop list — I’m so honored to be among them. I can’t wait to sit down with a cup of coffee and visit each one. I also wanted to add that I’m so proud to be a part of this crafty community we have. Just makes my heart happy. 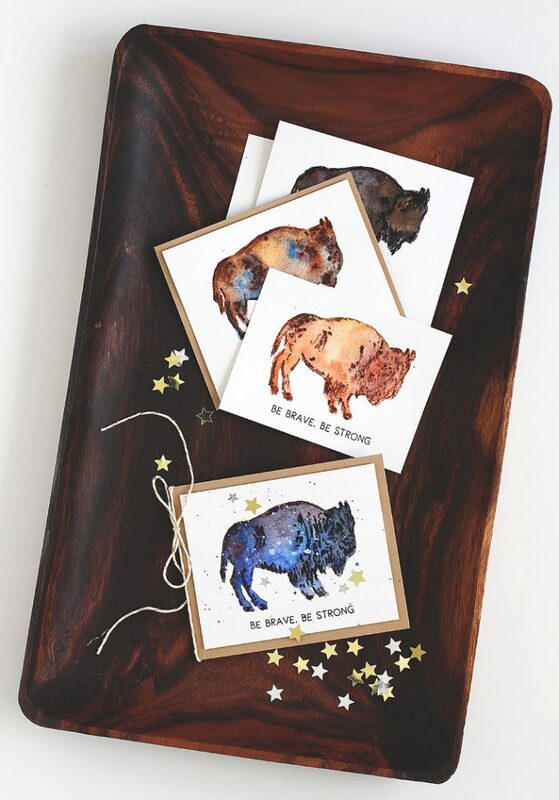 You choice of the bison is perfect for your fantastic card. They had a large herd of them at Ft. Knox when my husband was stationed there. I loved visiting them. On a recent episode of Zoo (on Animal Planet) the had a very interesting segment on their efforts to produce more pure blooded bisons. Blessings to you and your s for adopting and helping to support these animals. Neat idea. I really like the colors within each buffalo. I give to both of these charities too! 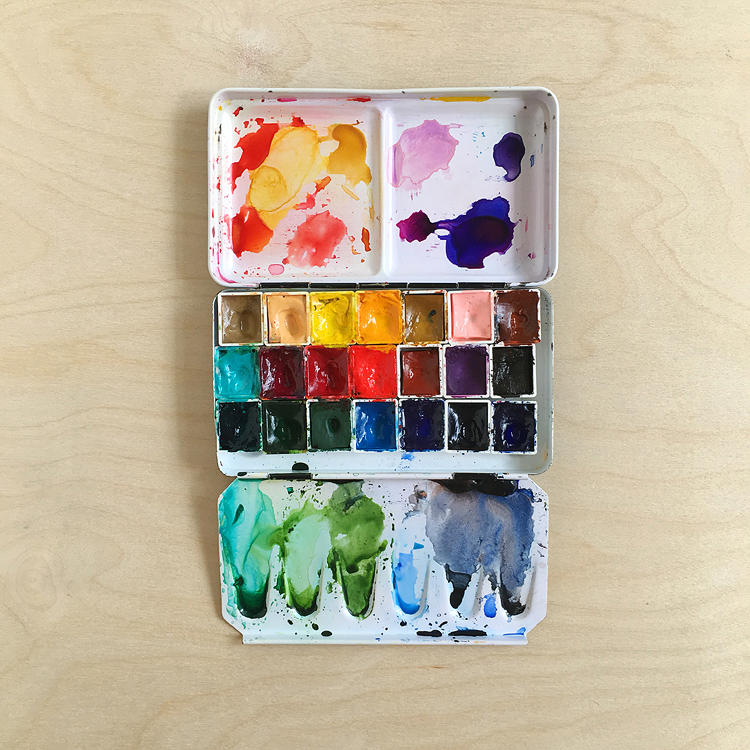 I love the look of watercolor. nice idea. Oh wow, amazing art work! Great card ideas, thanks for sharing. as a european I have no negative connotations about prarie dogs – I think they are absolutely adorable! I have seen them in the wild while traveling in the US, which was an amazing experience! Nice card! Thanks for sharing! I love love love bison too! Both WWF and DoW are on my charity list, so I love seeing them on this hop. I am definietly going to be trying this technique out, I’ve even bookmarked it! I love those cards! Thank you for sharing how you created the look! Really beautiful cards! Great charity! God gave. Us all those beautiful, wonderful animals of the wild! Thanks for helping Sandy help others! Great cards too!